I am very new at star hopping. Most of my observations have been with binoculars. About a month ago I purchased n ETX 80, which has a goto feature. But one of the reasons I selected it is that I can use it a manual scope by releasing the clutches. I am using the GoTo to help me rather than as a main method of observing. I live in a Bortle 6 or 7 location so many stars are not visible many evenings, even when the moon is not in the sky. I have no hint of the milky way. Vega, Altair an Deneb, The big dipper, and Cassiopeia look like lonely lights in a blue/grey velvet background. The stars in the great square and the northern cross are dim but visible. The sky to my south is almost devoid of stars. Polaris can be seen just above the branches of tall trees. My view is obscured by trees or bight street lights to the West and Northwest below the big dipper. My primary viewable sky is East and South. I have "Turn Left at Orion" and "Practical Sky Watching". I have a star map, a moon map and a planisphere. I have loaded Stellarium and have visited a variety of web resources. I am reading like mad. So, I should know everything there is to know about Star Hopping, right? What I am looking for here are tips and tricks that you have picked up along the way. Any fairly easy targets overhead, or to the East and South that you can recommend as I develop this skill? I know there are all kinds of books on the subject. I have enough books and web sites. I am looking for practical tips and your favorite recommendations for a newbie who is trying to learn star hopping. Edited by aeajr, 31 August 2015 - 11:35 AM. When there are few landmark stars, star hopping is more difficult, but still doable. What helps me get to where I'm going is to know the method of measuring degrees using the outstretched hand/fist/digits etc. Nightwatch has a good write up on the topic. The One Minute Astronomer website that talks about it as well. Add to the ability of measuring distances, is to identify some pointer stars out of the stars that are visible to help you get going in the right direction. Nightwatch again has good information and tips. The Big Dipper is a key to many constellations. Once in the constellation/neighborhood I often triangulate a specific object using brighter local stars. Edited by AngryHandyman, 30 August 2015 - 02:13 PM. - Keep those binoculars handy. They are great for figuring out what you are looking at. - if you have a tablet or smartphone, get SkySafari 4 Plus or (or Pro.) With your scope, with your binoculars, naked eye, pick an interesting art of the sky and just figure what you are looking at. Sky Safari is very helpful, you can use the compass mode to orient the chart to sky, you adjust the screen so it shows you what you are seeing. - Wander around with your widest field eyepiece, see what you can see, if you find something, figure out what it is reverse star hopping..
- Use your widest true field eye piece to locate and object. - Be relaxed.. Enjoy the view of the star fields..
My tip is to use binoculars to help. That mitigates the light pollution issue. ps, the acquisition of a 10 in. dob is helping some.....also a ST80 has been a great asset for wide field scanning the sky and trying to recognize star patterns. 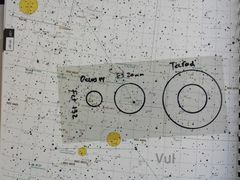 Get a piece of transparency plastic and draw a set of circles at the scale of whatever chart you use to represent the fov of you finder and low powere eyepiece. They will let you see on a chart exactly what should fit in a particular fov and plan out your route. I'm just a beginner, but here's what has worked for me. Get Cartes du Ciel, it's free. Learn to use it, it's worth the effort. Make custom charts for the areas of interest, including circles showing the FOV of your lowest power eyepiece and a path from a bright star. If your scope is an Alt/AZ, buy or make an inclinometer. Use Stellarium or some other app to get the altitude of your starting point. Set your scope to this altitude and scan in azimuth to find it. If it's bright enough to be naked eye you can skip this step and use your finder, laser, or whatever. I have a lot of light pollution and finding that first star is often the hardest part. Once you get used to relating what is shown on the chart to what you can actually see, the stepping is pretty easy. Cartes du Ciel has a options for dot size and magnitude limits and you need to play with them to find the best combination for you and your scope. Star Chart is a great free app that you may find useful. I highly recommend purchasing a copy of Alan MacRobert's Star-Hopping for Backyard Astronomers, if you can find one. You can never have enough books on astronomy and MacRobert's book is one of the very best on star-hopping. The way i gotten around is to pick a constellation that is in a comfortable piece of your sky. For me it was sagitarious and scorpius back in june. Every night i could i would pull the scope out and look at every object on these 2 constellations. Untill i can almost find every object on the area with minimal effort. Netx was the swan, eagle, lyrae and the arrow. Netx was andromeda and cassiopea. Next on my list is going to be orion and the pleides. As you can see mt patch of sky at my house is limited from north east to south east. So i just learn the constelletions as they come. Like it was said earlier, the green laser pointer is a big help for when you get disoriented, or find something you can see nake eye where your scope is pointing at. Planning your viewing sesion before you go out helps a lot too. That way you can study the charts and have an idea of what you are going to be looking at. Also having an idea(a realistic one) of how the object you want to observe looks like can help too. Like the first time i set out looking for andromeda. I had a rough idea on how to find it. I lined up on the arrow on cassiopea, swept across and came across this fuzzy ball. Nah this is not andromeda. Where's th galaxy looking thing with dust lanes and all the cool stuff? I spent the rest of the night hopping from every possible location to andromeda, and always ended up with the same fuzzy ball on my fov. This went on for about 3 hours untill i finnaly called it quits out of frustration. I fail at life, i can't even find andromeda with my scope. It wasnt untill i posted here on cn, that they guys made me realize that i was indeed looking at the right thing all along, but there was no way i was goint to be able to fit the whole thing in my fov. Pocket sky atlas is great I bought it a 2-3 weeks ago and I love it. It's helped me find countless Messier and NGC objects it shows me the exact view through my 9x50 finderscope. As a primary star hopper for decades, here's what I've found as the most efficient, or the method that works best for me. It may not work best for you. You have a huge strike against you with bright skies and few guide stars to get you in the ballpark, but as one of the others said, it's not impossible to find things, up to a point. Given that you have those bright skies, first off, know your targets! I repeat, know your targets! Don't go looking for something beyond not only the capabilities of you scope, but the sky conditions as well. I'd go knocking at least two magnitudes, maybe three off the limit of your scope to start with. Then there's the matter of surface brightness. Do your research. While some objects list a magnitude well within range of your scope, ahem... don't be so sure. Take the Helix Nebula or M33. Trust me on that. On the other hand, there are some objects that have magnitudes that you don't think your scope can reach, yet they have high surface brightness and guess what? That's why you need to look them up, especially when you get beyond the Messiers, for instance. Next, get a decent quality wide-field eyepiece. You DO NOT have to break the bank and get a high-end bauble that some might argue will give you the same views you can get in a 25-inch scope with a 10-inch scope. Don't believe the hype. All you need is a decent quality midrange EP with say, an 82 degree field, mid magnification so you can detect smaller objects, but not such a high magnification that you can't fit the really large ones into the eyepiece, within reason. There are a few objects that are just to large and diffuse for the average ocular but they usually require binoculars or extreme wide field low powers anyway, like the Witch Head and I doubt you'd catch it if your skies are that bright. Now, get a decent star chart, one that shows plenty of detail, but doesn't overwhelm you. The Tirions or even the Uranometra charts are good for that. If you really want to go cheap, there are plenty of alternatives, though I can't vouch for their accuracy. I personally use Megastar and despite what some might say, I love it and have never seen another program that has impressed me enough to switch. Now, though this is gonna cause some screaming from some people, get a 5mw (that's milliwatt) green laser pointer. Yup, notice I didn't say Telrad or one of those boxy pointer thingies. I also suggest some kind of optical straight through finder just in case the batteries go out on the laser, or it's too cold for the laser to work. I suggest a 50mm, so you have enough aperture to actually see something your aiming at. I also shouldn't have to go into the safety precautions with using the laser. Those threads have been beaten to death. Next, given what I've said above, select your target, say M57. You can tell about where it is between those two stars in the lower part of the lyre in Lyra. Now aim the laser between the two stars. Go to the eyepiece, assuming you've aligned the laser at dusk with some immovable object or Polaris or something. The chances are, if you have that wide-field EP in the focuser, you'll be right on the Ring Nebula. If not, start mowing the lawn a tad and you'll soon find it. When going for more difficult objects that are not as boxed in as M57, you just eye the area by using key stars, do a bit of mental calculations and measurements, then aim the laser at the spot. Maybe aim at a nearby star, then move to another one, then jump to the spot, using the gap between the two other stars as a measuring stick, more or less. I've used that method to find almost 2K faint fuzzies. It works, though the more challenging the object, the tougher the search can be, and not always successful. Sometimes, because some of the objects I search for are extremely faint, even if my laser gets dead-on, I might not see it and start mowing the lawn and miss it. Or, when I'm in the ballpark, I might mow the lawn and scan right over it and miss it. Back to square one, I try again and sometimes get it, sometimes not. However, brighter objects should be easy and with a little practice, you'll soon become a master. After all, this is all part of the fun. Best of luck if you try this. Edited by Feidb, 30 August 2015 - 05:52 PM. These were the kinds of tips and personal suggestions I was looking for. Sure some of this is in the books but hearing from all of you is wonderful. I do plan on picking out one section and focusing my efforts on that. Most likely The area around Andromeda, the great Square, Casseopia, and Vega. That has my best visibility and the most references stars. As one person suggested, I am going to work that area until I know it well. I have the star chart app on my phone but I find it very general. Not really useful for pointing the scope. Edited by aeajr, 30 August 2015 - 06:15 PM. Your idea about using a single constellations is a good one. Do youown a one power finder? (Telrad, Rigel, red dot) I you don't, you can just make sight tube from a toilet paper roll or a rolled up index card. After you attach it to the tube, (tape, rubberband ) you will be able to sight on one of the few visible stars well enough to place it into your finder. Now the fun begins. I like using a program called Stellarium. It's free and the laptop version will allow you to simulate you eyepiece view almost exactly. Use the computer map and eyepiece view to look for patterns of stars that bring you closer and closer to your target. You are going to have a wonderful time pulling you hair out finding these targets. This is pretty much what I did with my 8" dob as I worked through all 110 Messier objects. Also, I find that using my clutches on my Meade ETX60 is just plain akward. Think about using the motors, but not messing with alignment. Edited by tomwall, 30 August 2015 - 06:54 PM. I find it very easy to release the clutches on the ETX 80. Maybe it is different. I like the idea of a TP roll. I think I will get a Telrad as they seem to be universally recommended and I do not have any kind of site on the ETX 80. I hoped I could run Stellarium on my android pad but no luck. I use a method similar to Feidb, except you don't need one of those awful lasers. :-). It's difficult to star hop in light polluted skies, so I don't hop, but rather go right for the target. Look at the star map, and determine where the target is in relation to 2 or 3 easily visible stars. For example, M13 is between the 2 western stars of the Hercules keystone, about a third of the way from the northern star. Or, the Virgo cluster of galaxies is half way between Denebola and Vindemiatrix. Often times I'll make a triangle betwen the target and 2 other stars. If your finder is properly aligned, you will get very adept at aiming your scope right at the target and getting it into your low power eyepiece. So, skip the hop, and go directly to your destination! As mentioned above, make circles on a transparent piece of plastic, or of wire, that correspond to the field of view for your main eyepieces (low and med. power). Use these on your star chart to map out your hops from a visible star. Sometimes it's not the nearest, there may be a better path from a different landmark - use your atlas to figure this out. All good suggestions so far. I don't happen to agree with them all, but they are all good, and I know other people find them very useful. I don't like the Pocket Sky Atlas for star hopping. I love it in general. But, when I am star hopping, I start with the Sky Atlas 2000, and mine has the constellation patterns (ala Rey) hand drawn onto the charts. The reason I pick this is because the charts represent a large enough chunk of the sky that I can actually see the relationships of the brightest stars. The individual pages of the Pocket Sky Atlas, while wonderful in themselves, are sometimes hard to orient to the sky. They are more useful when you have narrowed things down a lot. But by then you need a very detailed book like Uranometria. Now, let's comment on Cartes DuCiel, Sky Safari, and all that. Computer stuff is nice for initial planning, but I find at the scope that they are harder to use. For one thing you have a lot of light pollution from them. No computer screen is dark enough, red or not. (Remember red light does affect night vision (not as much as other colored or white light, but it does affect it)----and brighter red lights like computer screens affect it even more.). Worse yet, it is just hard to hold a computer screen up over your head, with the left side to the east, and right to the west.......it is easy to do so with a Sky Atlas 2000. (Granted Sky Safari on an pad or phone is easy enough to hold up there, but it can be more difficult to be sure it is being held up in the right orientation that the SA2000. To do a square sweep move the center of the field of view to the top of the FOV. Then sweep left one FOV. If you do not find your object, then the ORIGINAL FOV to the top, and sweep left. If you do not find it, recenter, sweep right and left. If you still do not find it, put the ORIGINAL FOV in the middle, and sweep left an right again. If that stil ldoes not work (and you are not recognizing your star patterns, you may need a whole reset from the Telrad, or you may want to just expand your sweeps. But always keep that ORIGINAL FOV handy. Actually muscle memory helps a lot here. Learn just how much your favorite eyepieces cover. And really look hard at what size the object is. Also check out magnitude. Know the difference between surface brightness and magnitude. An object like M33 is a very dim object, although it is magnitude six or something--relatively bright in a telescope. But its magnitude six worth of light is spread over such a large area, that it comes out dim. Agian, I am not arguing against any other advice given here.........but I do have my own experiences to share. One more tip. Plan some easy hops thrown into your harder/never tried before ones. Particularly under lp skies, it's easy to get frustrated when you can't find what you are looking for. Give yourself breaks. Using geometry and a Telrad, a Rigel QuikFinder, or an LED dot pointer in conjunction with a finder scope can be effective under skies that are too light polluted for traditional star-hopping. Alex -- I would agree that Cartes du Ciel is of little value used live at the scope. But, it can create custom charts that are very useful. You can fine tune it to show only stars up to the magnitude that your scope and eyepiece are capable of, and you can control how large they are printed. You can add notes that are handy to have at the scope such as double star magnitudes and separation. You can include as many FOV circles as you like that match your equipment. And, you can flip or make the orientation any way you need. It takes more time than referring to a pre-printed chart, but you end up with something very handy. I save mine in folders by constellation for re-use. I have two apps that work well in my Kindle Fire tablet at the scope. Stellarium gives me a current overall view that helps me identify and orient constellations when I'm trying to make them out with binoculars. That's not always easy where I live. I can adjust the screen to a very dim red, and my bright sky means I'm never fully dark adapted anyway. LunarMap HD cost me a whole 99 cents, and it's terrific for learning features on the moon. Edited by dwheels, 30 August 2015 - 10:01 PM. For novices, the inexpensive Bright Star Atlas 2000.0 is probably more useful than the Pocket Sky Atlas for locating objects. Prepare in advance. Pick your targets and print out a paper star chart with your targets and route marked. In light polluted areas such as mine, you'll be able to read these without much, if any, illumination. Prepare your equipment early in the night - do your polar alignment, calibrate your finder, and set out your eyepieces so that you can get to them by "feel". Establish your night vision. Don't start looking for anything faint until you can see in the dark, you'll just pass right by those faint fuzzies without noticing. For me this means no screens, no lights, just viewing easy to find objects for the first half hour or so after the sky is well darkened. Preserve your night vision. Avoid looking at any lights while you are star hopping. For me this meant building a small observatory and planting a bamboo hedge to act as a light shield from nearby businesses. You might not have to go to so much work, but you should intentionally avert your eyes from any nearby lights. Don't give up, but recognize that it takes a lot of practice. If you aren't able to see a particular target after trying and trying, move on to something else. You can always come back to a more difficult target later in the night, or later in the month. I need to note up front that when I mentioned that I use Megastar as my primary star charting program, I DO NOT use it in the field! I prepare observing lists and pre-print the charts before I go observing. The only technological doodad I ever take in the field is the laser pointer. Period. Everything else is pure manual and old school hockey. Just wanted to make that clear since someone else mentioned using a computer in the field. Egads! I'd never do that. As always, you are all very generous with your time and in sharing your experience. I will look at all the links and study the advice. I have not really done much star hopping yet. Most of my time so far has been just getting to know some basic stars and star patterns, asterisms. I have more time on the binoculars than the telescopes. Today I get up from the TV around 10 pm, stick my nose out the door and if it is clear I grab about 45 minutes of unplanned star gazing with binoculars or telescope before I head for bed. Time to start planning these sessions. The finder on the Tasco 3" reflector is horrible and almost unusable. The Meade ETX 80, as a GoTo, does not have a finder. I have been thinking of adding a Telrad zero mag finder to that. And, as I stated in the first post, I have picked out a region, around Andromeda, that I am going to concentrate on and get to know that region first, learning what is there using the goto and learning to star hop. I have located a couple of things because someone gave me specific directions in a post, the Coat Hanger, for example. To to Deneb, now go down the shaft of the Northern Cross till you find Alberio. No look off at this angle for about this far and you should find it. Well it took a little scanning, but I found it with my binoculars. That was fun! I have also done a little using the goto to find something so I know roughly where it is and what it looks like. Now, see if I can find it manually. But I have not put any real planning into the effort, sort of random. That needs to change. I have two apps on my phone. Star Chart seems cool but not very accurate. I just loaded SkyEye which seems to get better reviews for accuracy and some have suggested holding it on the telescope as a push to guide. That sounds like the Orion Intelliscopes. I may try that as part of my star hopping education. Now it is just a matter of time and adding some planning to my observations. Edited by aeajr, 31 August 2015 - 10:57 AM. A lot of good advice..